A ‘klenteng’ is a Chinese Buddhist Temple. This one, a striking construct of dramatic murals, bright red roofs, a lotus pond filled with white and pink flowers, a mini-bridge and a mini-garden, is one of the prettiest on the island. It was founded in the year 1873, in relation to the Ching Dynasty that was in power in China at that time. Check out the carved and painted wooden gates. Don’t be surprised to see some turtles wandering about, and definitely don’t step on them by accident. If you’re going to enter, take off your shoes. Inside the temple prayer prayer room you will find a number of gold buddha statues. How popular is Klenteng Ling Gwan Kiong? People normally club together Museum Gedong Kirtya and Lovina Beach while planning their visit to Klenteng Ling Gwan Kiong. Nice chinese temple but surprisingly no one can speak mandarin or dialect. The Tri Dharma Temple, very unique, historic and well maintained temple. In this temple three different religions are celebrated, Taoism, Confucianism as well as Chinese Buddhism. 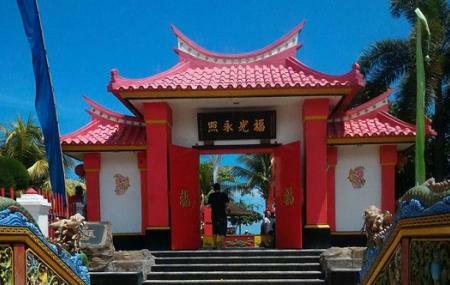 One of 2 Chinese temples in Singaraja, but Ling Gwan Kiong is quite popular since it is located inside ex-Buleleng Seaport area. No ticket to go inside. The guide Mr Tan whose father is Chinese and Balinese mother will explain history of the temple if you are interested. There is donation box inside the temple, you could donate or not as you wish. This is an amazing temple, a precious capsule of the Chinese culture in Singaraja! I was able to read all the signs and murals in Chinese, wow, I was amazed by how much the immigrants honor and preserve the Chinese culture! On the wall near the altar, you can find numerous mural panels depicting the Romance of the Three Kingdoms, which is a household novel based on the real history of the Three Kingdoms nearly 2000 years ago. In this temple three different religions are celebrated, Taoism, Confucianism as well as Chinese Buddhism. I talked to the guard of the day, whose father was Chinese and mother Balinese, both Singaraja natives. The friendly guard told me that there are about 300 Chinese descendants in Singaraja and about 500 in Denpasar. I asked him what religion he practices, and he told me Confucianism. He views Hinduism, Confucianism and Taoism to be the same, all about honoring the way/dharma/nature. Quite an interesting place indeed!